Labor Day arrived and with it the opportunity to grill something fitting of the holiday. 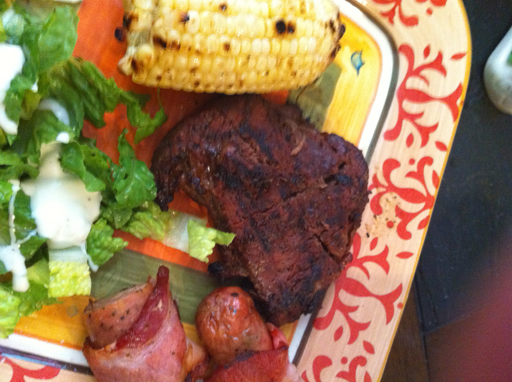 So I grabbed some T-Bone steaks, bacon, corn on the cob, and sausages. We pre-cooked the bacon until it was about half way done. Then we wrapped the sausages (which were stuffed with garlic and artichokes) and cut them into halves and wrapped each piece in bacon. 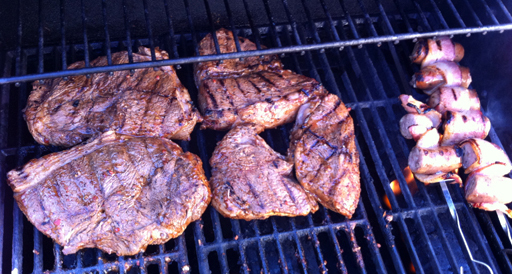 We had been marinating the steaks in a special steakhouse spicy marinade for about 2 days. We fired up the grill and put on the steaks and bacon wrapped sausages. When the steaks and sausages were getting close to being done we through the corn on the cob onto the top shelf of the grill. I had melted some parmesan cheese into some garlic butter and brushed the corn down evenly while it grilled. When all was done we served it up with a bit of salad, and ate until we couldn’t move.